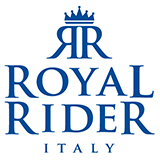 RR PERFECT, first revolutionized the world of stirrups by introducing the use of a high-strength techno polymer into the production concept. The result is a lightweight but highly resistant stirrup, with highstructural integrity. The severe tests to which it is subjected are able to certify that the techno polymer guarantees high performance, together with an excellent durability,adapting perfectly both at high and low temperatures. The wide arch makes this stirrup spacious and ergonomic, ensuring highstability and safety:naturally accompanies the rider's movements and is perfect for all disciplines. The soft and elegant lines draw a prestigious, timeless accessory that leaves with its classic aesthetic a sign of elegance and distinction. The bench has a strong stainless steel grip, shiny gloss, extremely durable. A non-slip rubber spare part is supplied to satisfy every need. 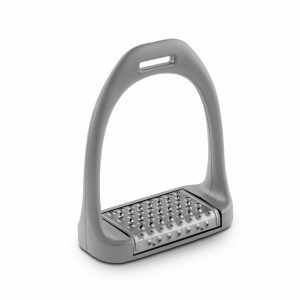 Supplied in three models in black, grey, silver with satin finish. 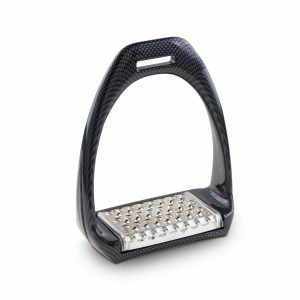 The wide arch style makes this stirrup comfortable and ergonomically, ensuring high stability and safety: it naturally accompanies the rider's movements and is perfect for all disciplines.